The City of New York was Admiral Byrd's flagship during his famous Antarctic explorations. Although she only made one trip to the frozen south, she became famous for her exploits. In addition to her voyage of exploration, she had a long career as a merchant ship, survived to be one of the last working commercial sailing vessels in North America, and may have played a role on one of the greatest maritime disasters of all time. 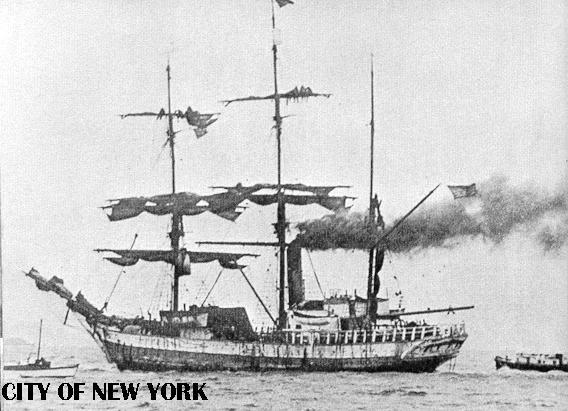 The famous polar exploration ship City of New York started life as the sealing barkentine Sampson, built at Arendal, Norway, in 1885. She was of amazingly strong construction, her hull being 34 inches thick in places. Old stories, supported by some facts, indicate that she may have been the "mystery ship" on the night RMS Titanic sank. Many people have long claimed that the lights of an unknown ship were seen near Titanic that night. It is said that Sampson was that night engaged in illegal sealing operations near the spot where Titanic went down. The sealers saw a large, fast ship approach and fire rockets into the air. Thinking the ship to be a revenue cutter out to enforce the law, they fled. Instead, the ship was supposedly Titanic firing distress rockets after her fatal brush with an iceberg. After a long career as a sealer, Sampson was purchased in 1927 by Admiral Richard E. Byrd for use as a polar exploration ship, to support his voyages to the Antarctic. On passage to New York for refitting she ran into a terrible storm and was nearly lost. Her steam engine was disabled by the storm, and the Atlantic crossing took 3 months. At New York she was completely rebuilt, rerigged as a bark, and made ready for her new duties. City of New York immediately prior to the expedition to Antarctica. City of New York departed New York on 25 August 1928, headed south for New Zealand. Arriving there on the 26th of November, she took on final supplies and set out for Antarctica. To save her coal supply she was taken in tow by the steamer Eleanor Bolling. The ships were struck by a heavy gale on December 7th, causing the towline to part. 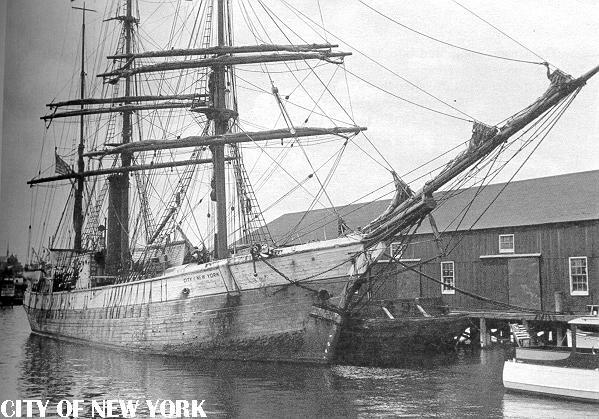 City of New York was left on her own in the storm with 30 fathoms of line hanging from her bow. It took two hours of all hands work to bring in the towline. Upon reaching the ice pack City of New York pressed on alone, locating a suitable spot for the Antarctic base on January 1, 1929. The base was promptly named Little America. City of New York unloaded her cargo, then attempted exploration trips through the ice. The conditions turned against her, and she had to abandon further exploration attempts. 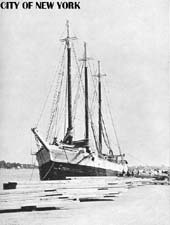 The ship departed for New Zealand in mid-February, but barely made it out of the ice pack. After refueling from a supply ship she pushed north through terrific gales; she was nearly lost. She laid up for the winter in New Zealand. 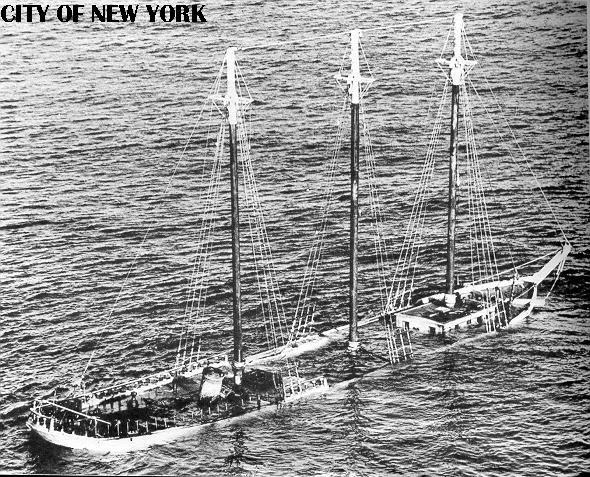 City of New York again sailed south on 5 January 1930. She ran into heavy weather from the start, and reached the ice only with great difficulty. Upon reaching the ice she was struck by a 100 mile an hour gale; her engine failed to hold her against the wind. She was driven backwards towards the ice. To save her rudder the captain swung her broadside to the ice, and she rode out the storm in the ice. Soon after freeing herself from the ice she ran into another gale. This storm built over 200 tons of ice on City's rigging (the ship's displacement was normally 500 tons). This storm blew her 300 miles off course. City finally arrived at Little America on February 18th. Evacuation of the base began at once; within 24 hours the ship was pushing north again. City of New York returning to New Zealand in 1930, showing the effects of her voyage. Upon returning home the City of New York was replaced by the famous Bear. City of New York became a museum of polar exploration, touring the Atlantic coast and the Great Lakes. She ended up at Cleveland, where she was trapped in her berth by a newly constructed bridge. There she remained until World War II brought great need for shipping. To help meet the need City's masts were taken out and she left the Lakes for a return to service along the east coast, sailing from Halifax. She was rerigged as a three masted schooner, stripped of her engine, and re-entered service in 1944. 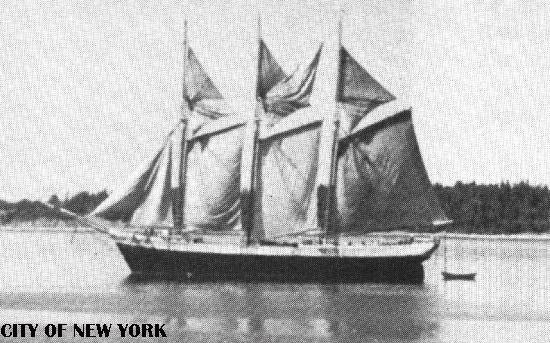 City of New York as a fully rigged schooner. City of New York as a motor schooner, loading lumber at Quincy Lumber Company, Quincy, Massachusetts, October 1962. Late in 1962 City of New York was sold for use in the Prince Edward Island potato trade. On 30 December 1962, before she entered her new service, she broke her tow and drifted onto Chebogue Ledge outside Yarmouth Harbor, Nova Scotia. A stove overturned, starting a fire; the ship quickly filled and sank. 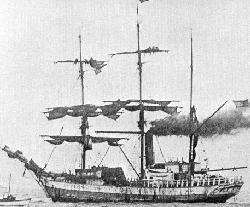 Storms later broke her up and washed parts of her hull ashore. 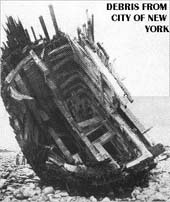 City of New York aground, burned and sunk. A piece of City of New York's hull washed ashore.